Saturday, January 13, 2018 — a date which will live in infamy — the islands of Hawaii were suddenly and mistakenly alerted to an incoming ballistic missile – origination unsaid, but assumed. The alert came at 8:08 AM, ironically about 20 minutes later than the December 7 attack on Pearl Harbor, which commenced at 7:48 AM on a sleepy Sunday. Oahu and the Hawaiian Islands are not as sleepy as they were 76 years ago, and the alerts – generated by Hawaii’s Emergency Management Agency – were sent out to tens of thousands of smartphones on all of the Hawaiian Islands. 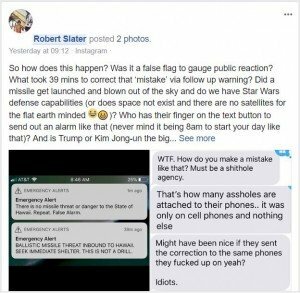 The message was clearly official, and was issued during a time of aggressive cyber rattling/saber Twittering between the Trump administration and the Democratic People’s Republic of Korea – a rogue nation whose recent nuclear tests and missile firings have raised the threat level to Hawaii – and world peace. 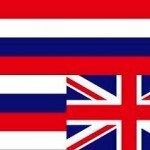 On December 30, 2017, Hawaii dusted off a nuclear warning alert which had been silent for 30 years. 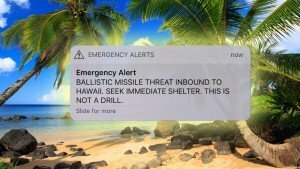 To put it lightly, the emergency alert was taken dead serious from Hanalei Bay to Hilo – by people who all of a sudden realized they had no escape plan whatsoever when faced with a missile threat – nowhere to run to, nowhere to hide. 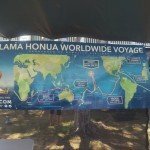 Social media went berserk, from Kelly Slater to Tulsi Gabbard as the clock ticked and citizens scanned the sky and their smartphones and computers – waiting for either contrails and mushroom clouds, or an all clear. 8:05 HST A routine internal test during a shift change was initiated at the Hawaii Emergency Management Agency (HEMA). This was a test that involved the Emergency Alert System, the Wireless Emergency Alert, but no warning sirens. 8:07 HST A “push alert: from Hawaii EMA went out to smartphones across the Hawaiian Islands. 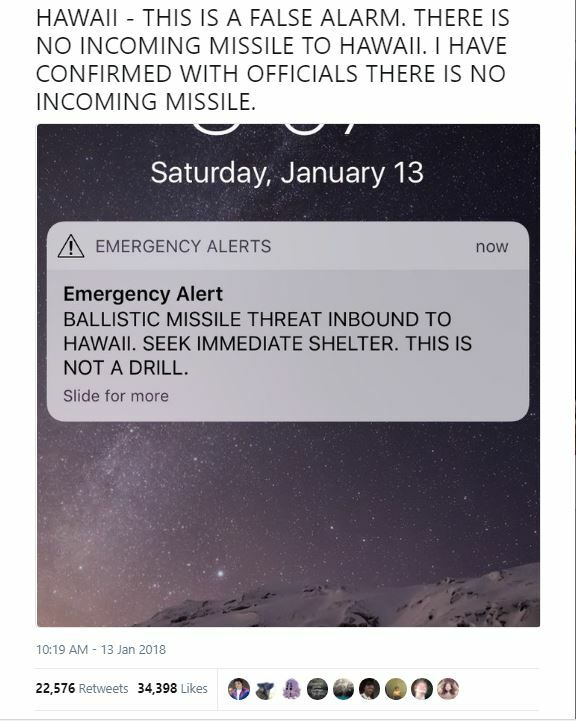 8:10 HST Hawaii National Guard Adjutant General Arthur “Joe” Logan contacted U.S. Pacific Command and confirmed there was no missile launch or threat. >8:10 HST Honolulu Police Department were told the missile alert was a false alarm. 8:13 HST officials use State Warning Point System to cancel the alert, and prevent the text message from being sent to additional phones. 8:19 HST Hawaii State Representative Tulsi Gabbard tweeted to her constituency: Don’t panic.